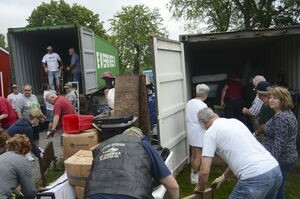 Approximately 50 to 60 volunteers amassed June 9 at the Raccoon Township home of Tom and Linda McCormack to orchestrate what looked like chaos into an organized assembly to fill a 40×9-foot tractor-trailer that can hold approximately 25,000 pounds. McCormack and his helpers collect medical equipment — wheelchairs, beds, walkers, crutches and prostheses — to send to the needy in Panama. Bernie Mrusek riffles a box of unsharpened, wooden pencils — Eberhard Faber No. 3 Hard. The retirees from Brighton Township don’t need hundreds of pencils. And even if they did, they could afford them. But schoolchildren in rural Panamanian villages need pencils — and paper, notebooks, backpacks and more. They can’t afford them. “Kids there have to pay for a piece of paper to do their homework,” Ruth said. That’s why most Fridays — shortly after sunup — the Mruseks drive about 25 miles across the state line to Rogers, Ohio, to buy school supplies and other essentials at Rogers Community Auction and Market, one of the largest open-air flea markets in the tri-state area. They’re among a platoon of pickers and packers marshaled by 69-year-old Tom McCormack of Raccoon Township, who for the past 15 years has almost single-handedly spearheaded efforts to improve quality of life in the environs of Chiriqui, Panama’s westernmost province, shepherding shipments of medical equipment, prostheses, clothing, school supplies and soccer balls to the city of San Jose de David. Unlike some humanitarians who claim to have a “vision,” Tom basically stumbled on his tour de force while participating in a federally funded agricultural program to provide educational assistance to farmers in developing and transitional countries. He and his wife, Linda, operate McCormack Apiaries Inc. on their rural property, where they manage beehives and specialize in honeybee products and pollination services. “I’m the only one who went back more than once,” Tom said. Like industrious bees, Tom’s abuzz with energy; driven and focused. Words fly rapid-fire when Tom speaks about his work, which quickly evolved into a passion once he noticed the poverty and inequality in Panama’s rural versus urban areas. Stung by the disparity, he couldn’t turn his back once the farm program ended. Panama, especially the area around David, would become his second home — a place he visits yearly, often spending six months at a time volunteering in a clinic where he helps to fit amputees with prosthetic feet, legs, arms and hands. David is Panama’s third-largest urban area with a population of roughly 100,000, Tom said. A bustling city about 20 miles from Costa Rica, it’s a hub for Chiriqui’s commercial and agrarian activities — cattle farming, coffee, sugar, cacao and tropical fruit production. It boasts shopping centers, apartment buildings and condominiums, restaurants and nightlife. Tom rents a condo when he’s there. But drive into the nearby Cordillera de Talamanca mountain range and the economic extremes are starkly apparent. More than one-quarter of the country’s 3.5 million people lives in poverty, according to the Borgen Project, a nonprofit organization addressing global poverty. And nearly half of those living in rural areas, especially indigenous people, suffers from poverty. On his first Farmer-to-Farmer trips to Panama, Tom lived with one of the families participating in the beekeeping program. That’s when he became immersed in the country’s customs and culture — and learned Spanish. “I live in the culture,” he said, making it easier to absorb than reading about it. “All you need is a passion to learn,” which pretty much sums up Tom’s approach to life. It’s also when he noticed Chiriqui’s poor — many living in ramshackle structures with dirt floors, children sleeping on cardboard — needed help, too. Initially, he collected used clothing and shoes, shipping about 3,000 pounds the first time. And then he noticed the old woman. Embarrassed, she tried to conceal her appearance by covering her torso. One breast prosthesis quickly multiplied into hundreds, along with prosthetic limbs, canes and crutches, walkers and wheelchairs, hospital beds, eyeglasses and hearing aids, medical supplies, wigs, adult diapers, linens — all donated and given free to Chiriqui’s residents, public hospitals, clinics and nursing homes. In Panama, healthcare in public hospitals and clinics is free, Tom said, but people in rural areas have limited access. Facilities are too far or people have no way to get there. If they do, wait times are extended. Panama doesn’t have government-supported aid programs like Social Security, Medicaid or Welfare, either, he said, making it hard for people of limited means to afford medical-assist devices and expensive prostheses. An above-the-knee leg can cost a minimum of $25,000, he said. About 10 years ago, the nonprofit Thomas L. and Linda J. McCormack Foundation was launched to facilitate the mission, which June 9 shipped its 15th container jam-packed with supplies. Tom, a humble man, deflects accolades about his work. The foundation wouldn’t exist, he said, without the help of volunteers — so many he can’t count — and other organizations such as the Butler District Lions, Limbs for Life of Oklahoma City, Global Links of Pittsburgh, Ellen Meadow Prosthetic Hand Foundation and Panamanian organizations like Lady Lions Club, Rotary Club and Eagles of Iron motorcycle club, all in David. “Oh, we have lots of people in Beaver County that come with donations on a regular basis. Some of them are one-time donations or other people have their eye open all the time to see what they can find,” he said. Tom accepts donations all year. He spreads the word by emailing friends, at meetings with his Vietnam veteran buddies, and the Beaver County farmers’ markets where he sells honey and related products and also displays pamphlets, photos and other information about the foundation. Some people drop bags of stuff at his farm market tables in Beaver and Ambridge; others deliver goods to his house where he stores them in a 20-foot container in the backyard or a huge, red barn until ready to ship. Bernie and Ruth Mrusek are among his people. Tom calls them his “best scroungers.” They met at the farmers’ market in Beaver. It’s 8 a.m. Some of the vendors at the flea market in Rogers are still setting up — unpacking wares for display and sale – but the Mruseks already have begun the hunt. It’s become the couple’s hobby the past 15 years. He’s retired from the engineering department of former US Airways; she’s a retired nurse. “Who’s in charge here?” Bernie, tall and imposing, bellows in an authoritative voice that demands attention. Vendors quickly snap to the ready. Bargaining begins. “You taking the box or just the pencils?” one asks. “That’s good,” the vendor replies. An easy transaction to start the day. Often, however, it’s not that easy, even for a shrewd negotiator like Bernie trying to sway an unyielding dealer from a fixed price. “Who’s in charge over here?” he shouts in his customary salutation. “I am, sir,” a woman says. “Give me a price I can’t refuse,” he says, holding up a backpack. “I can refuse that,” he says, countering with $3. Ruth says her husband will spend $2 on backpacks; $2 or $3 on soccer balls. “I like to get soccer balls for them because they can’t afford to buy those kinds of things,” Bernie says. The Mruseks try to adhere to a budget of $40 a month. They know if they don’t seal the deal this week, likely a vendor will come down in price the next week or a couple thereafter. It’s a waiting game. However, she tells vendors where their purchases are going. She shows them pictures of Panamanian kids proudly sporting backpacks, playing with soccer balls, dressed in new-to-them clothes. And sometimes it pays off. One week, she bought fleece fabric telling a vendor the material would be used to make blankets for Panamanian children living in rural outskirts and mountainous regions where it gets chilly at night. The vendor returned her money. Another time, a woman standing behind and overhearing Ruth’s story about the McCormack Foundation, shot her hand out with $10. “Here, get them something,” she said. Joe Omlor of New Stanton, Pa., a regular dealer at Rogers, knows about their philanthropic hobby. The Mruseks estimate they spend eight hours a week scrounging not only at Rogers, but yard sales, church rummage sales, Trader Jack’s Flea Market in Collier Township and the consignment auction Thursday nights at Fairview Grange in Ohioville. “Church sales are the best. You can fill a bag the second day for a dollar,” says Ruth, whose weakness is “girlie stuff” — cute clothes and nail polish. “I never had a girl,” says the mother of a son and grandson. Never had a chance to match a pretty outfit or brush long hair, then braid it in frilly bows. Ruth buys little, stuffed animals, too. On this Friday, they spend approximately $15 on four pieces of fabric; five blankets; one backpack; 20 toothbrushes; 10 children’s clothing items; two stuffed animals; and 250 pencils. “We go out of here like donkeys,” Ruth says. Bernie tallied their haul last year and came up with 98 soccer balls; 90 backpacks; one sewing machine; 160 articles of children’s clothing; 200 skeins of yarn; five bed sheets; and three boxes of assorted school supplies. June 9, Tom and Linda McCormack’s yard looked like a parking lot littered with pickups, SUVs, vans and cars. It was just past 8 a.m. and already 50 to 60 volunteers amassed to orchestrate what looked like chaos into an organized assembly to fill a 40×9-foot container that can hold approximately 25,000 pounds. The container was delivered by D.T. Gruelle Co., a Moon Township-based shipping and transport company specializing in logistics, customs brokerage and freight forwarding. The past few years, Tom said, Gruelle has also paid part of the $5,000 shipping costs to Panama. Tom and Linda pay the rest out of their own pockets. Bill Laughner of South Beaver Township has been part of the packing team for four years. It took about two hours before not another thing could be stuffed into the container. It was trucked to a Baltimore port, and then loaded on a ship for transport to Panama, with expected arrival June 23 in Colon. The container is trucked about 10 hours to David, where 40 to 50 local volunteers unload the goods to a warehouse for distribution. Tom will arrive June 22, staying several weeks to oversee operations, assisted by David’s mayor. Tom’s quick to say that he pays for all of his own expenses — travel, lodging, food. Nothing comes from the foundation. He’ll return to Panama in October and stay through March, while Linda remains home tending to the beekeeping business. That’s when Tom gets to work fitting people with prostheses. He’s upfront with amputees who come to the free-of-charge clinic. “I’m not a doctor,” he tells them. Never studied orthotics and he’s not a certified prosthetician. He wouldn’t be permitted to do this work in the United States. Things are different in Panama. But Tom knows a lot about mechanical engineering. He retired in 2000 from the former US Airways where he spent 33 years as a mechanic. He’s also friends with a prosthetician in West Virginia who shares his knowledge. One of Tom’s sons lost a leg as a teenager and wore a prosthesis, he said. Some amputees travel eight and nine hours by bus to the clinic. Once there, some don’t have fare to return home. Tom gives them the money. He says he’s fitted 272 legs, 48 hands, seven arms. Sometimes, especially with short-residual arm amputations, he crafts prostheses out of PVC pipe. Most leg amputations are caused by diabetes or accidents. Hands and arms are lost to snake bites, errant machete swings in sugar cane fields or fishing with dynamite, he said. Birth defects account for amputations, too. Fourteen is the youngest person he’s fitted; 94 the oldest — both legs. Hundreds of women have received breast prostheses, fitted at a beauty shop. The clinic is free and doesn’t ask for donations, but grateful recipients often give something — a bag of eggs, a coconut. One man waiting to be treated noticed how hot it was inside the tin-roofed structure. Tom told him it was only going to get hotter as the day progressed. The average temperature year-round is 90 with 80 percent humidity. The man returned with an air-conditioner. “When I see a young girl come in, maybe 25 years old, and she has a young child maybe 10 or 11 years old with paralysis — they’re as stiff as a board, all twisted up — and we can fit them into a new wheelchair that tilts back and has head supports and chest supports and legs rests and with a few pillows and so forth, now she’s able to take him outside of the house. Tom turns 70 in November and acknowledged that some day, he’ll have to retire. Right now, he has no intentions of doing so. “As long as I’ve got my health, I feel good,” he said. He still has drive, still has energy and backs it up by recounting a 9-hour hike he took on his last trip to Panama, when he ascended Baru volcano, Panama’s highest peak. But has he tapped anyone to continue his mission?